We Work Together With You To Achieve Your Fitness & Health Goals! Hello! Thank you for your interest in our class bundles. Above class bundle prices do not include Joining Fee of $49 / person. If you have not paid your joining fee before, you may be asked to pay $49 per person before the attending your first class. 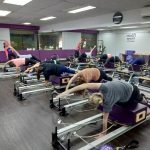 Class bundle may be used for all Reformer and Chair group classes at all Pilates Fitness studios in Singapore. You will not be able to join the class if you late for 10 minutes or more and the class is charged. Class Cancellation must be made 12 hours before the class, no-shows will be charged. We encourage you to share the goodness of Pilates with your loved ones. Your loved ones can share your Pilates Bundle at a joining fee of $49 per person. Note that sharing of Pilates Bundle DOES NOT apply to Unlimited Group Class Bundle. Each Pilates Bundle can be shared among a maximum of 5 persons. All Pilates Fitness classes and bundles are non-refundable and non-transferable.